The curtains are finally down and Apple announced the new iPad mini 2 and iPad Air. Both the new tablets from Apple feature a great improvement over the previous generation tablet. iPad Air, dubbed as the iPad 5 but not officially, features the same screen size of 9.7 inch and the iPad mini 2 has a 7.9 inch screen but with a Retina display this time. The rest of the details for both tablets are below. With the introduction of Retina display in the iPad mini 2, the resolution is now increased to 1536 x 2048 giving a pixel density of 324ppi and 4:3 aspect ratio stretched over a 7.9 inch display. On the processing side, iPad mini 2 now has the latest Apple A7 chipset processor and a powerful PowerVR SGX 6th series GPU that provides immense graphics quality for true gaming and media experience. iPad mini 2 will be available in 4 different storage options of 16/32/64/128GB with the respective price tags of $399/$499/$599 and $699 for the Wi-Fi only models and $529/$629/$729/$829 for the Wi-Fi + Cellular model. Color options available are Silver/White and Space Grey/Black combination. 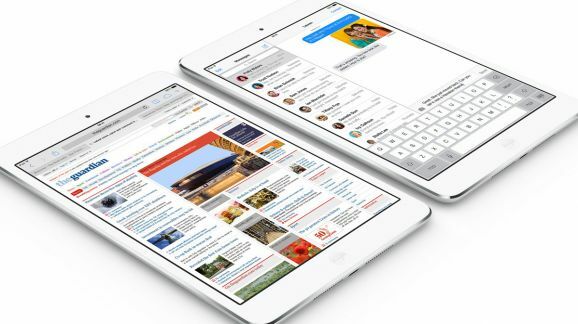 The first iPad mini will be still in production and will continue to sell at $299. Apple iPad Air also features a lot of improvements over the previous generation iPad starting from the name change to the iPad Air and not the iPad 5. iPad Air gets the new Apple A7 processor and M7 motion co-processor. iPad Air also gets a huge design change and it is basically influenced from the iPad mini and has narrow bezels that makes it easier to hold the 9.7 inch screen tablet. iPad Air now has a 9.7 inch IPS LCD screen with 1536 x 2048 resolution. There is no touch ID motion sensor like many predicted in previous rumors. Another great thing is the reduction in the size and weight of the iPad Air. The new iPad Air weights only 1 pound (469 g) compared to the 1.33 pound (601 g) for the iPad 2.
iPad Air starts from $499 for 16GB version and goes up to $799 for 128GB Wi-Fi only model. For Cellular version, you have to pay an additional $130 for any capacity model. Color options available are Silver, White and Space Grey.